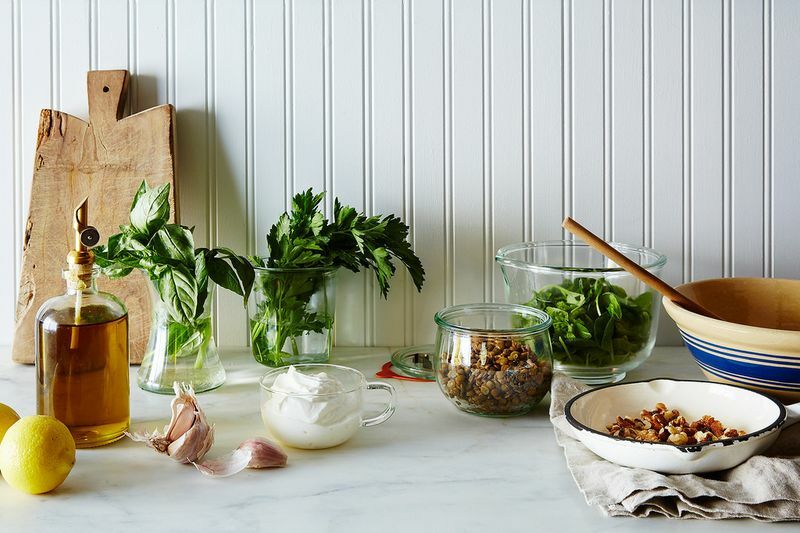 Yes, you can un-wilt herbs—sometimes. Here's what you need to know. A few hours later—tragedy! Moisture loss! Whether you do this or not, you will encounter wilty herbs sometime—I discovered their salvation quite by accident, no thanks to them. I was testing recipes in my stifling 6th floor apartment and the basil I'd propped up in water had all but gone to heaven. But at one point, I noticed that some of the leaves had fallen into the water itself, and looked bright and perky, like they'd just come back from a spa day. This works very well for soft, delicate herbs like basil, cilantro, and mint; less so for hardier ones like parsley and thyme. I assume that this is because they're more permeable—the easier it for them to lose water (that is, the more prone they are to wilting), the easier it is for them to take it back in for a full revival. That said, my testing is incomplete, and largely done in a very humid New York City summer, so I want to know what you've witnessed in the wide world of wilting herbs—please tell all in the comments. Has anyone tried reviving softened root vegetables in a similar way—by dunking in cold water for 15-20 minutes? I recently heard about this method and am eager to try it. Absolutely, it works. even when they are cut up, like carrots into carrot sticks. Had our own little contest last Thursday when the mint for the peach shortcake garnish went totally limp. We had the time it took for guests to eat dinner to revive- and the winning method was to choose promising leaves, dip in cold water, shake, put between paper towels and chill. Reminded me of how mom crisped up the lettuce in the fridge after she washed the leaves. Each shortcake went out with a lovely little erect green flag. Dunking in water is all good. However, I've found that trimming the stems with a very sharp knife or pair of scissors helps some of these herbs immensely, just like extending the life of cut flowers. My lettuces normally get trimmed, dunked, shaken out, then wrapped up in a old tea towel in a plastic bag. For basil, snip off the flowers. That tells the plant that it needs to keep growing. If you grow your own, you know that flowering basil is near the end of the plant's life. I will definitely try this. I find that the basil in the water glass trick works with a couple of additions: the plastic bag over the herbs help, but I also change the water as often as I can remember (daily is best, but do what you can). For some reason, this helps tremendously. If things are wilting, cold or icy works well. But I have to disagree with you about the basil. I almost always have a glass filled with basil sprigs next to my kitchen sink. They almost always root and grow for as long as I need them. They keep longer and in better condition if I snip off the blooms. My sad basil is going into some water now! Keep a plastic bag over the basil and it should stay fresh for days.